PHUKET: For seven days and seven nights, the annual Wat Chalong Fair has returned for another year of fun and festivities at Phuket’s best-known temple, held each year coinciding with Chinese New Year. Popular Thai artists perform live music concerts each night of the fair. The fair this year began on Wednesday (Feb 14) and will continue until next Tuesday (Feb 20), explained Chalong Mayor Samran Jindapol. “Everyone is welcome to to join the fair,” he said. 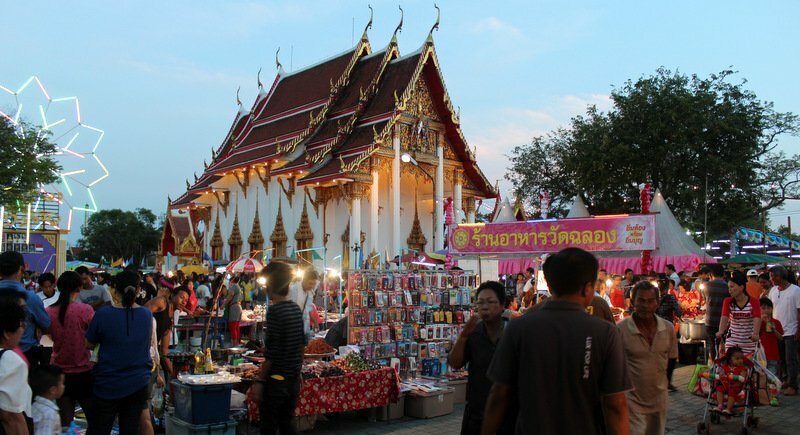 Chalong Temple, officially called Wat Chaithararam, is the spiritual and cultural centre of local people in the community and the fair is an opportunity for people in the community to gather and have fun with entertainment and pay their respects to the Buddha. Wat Chalong, or Chalong Temple, is the largest temple in Phuket and its annual fair matches the temple’s size and prominence, running for seven days and seven nights. As the festival coincides with the Chinese New Year celebrations, many Chinese people also to pray and pay their respects to Buddha to mark the Lunar New Year. There are hundreds of stalls from many provinces across Thailand. As well as funfair during the day, there will be activities in the evening, including shooting stalls, balloon darts, a Ferris wheel, merry-go-rounds and others. Stalls selling food, clothes, plants and handicrafts are also present. Popular Thai artists perform live concerts each night as well as a shadow puppet play (or Nang Talung), Manohra dance (a traditional Southern Thai dance) and Likay, a traditional musical folk drama. The annual fair each year lures big crowds, prompting Chalong Mayor Samran to today urge parents to keep an keen eye on their children while at the fair. “They might get lost easily as there are a lot of people,” he told The Phuket News’ sister newspaper Khao Phuket. “Please be careful of bad people who might trick you or steal your wallet, even though police and civil defence volunteers patrol the fairgrounds,” he added. “Also, the fair creates a lot of traffic in the area, so we advise people to come in groups as parking space is limited,” Mayor Samran said. “Everyone is invited to come and join this event to make merit and pay their respects at the temple. Come and enjoy the delicious food and live music and entertainment too,” he added.